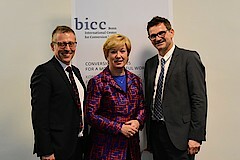 BICC (Bonn International Center for Conversion) was founded in April 1994 as a non-university think tank of the State of North Rhine-Westphalia on the initiative of the then Minister President Johannes Rau and the then UN Secretary-General Kofi Annan. Today, BICC is the largest peace and conflict research institute in North Rhine-Westphalia. "After the end of the Cold War, the conversion of former military resources was an important focus of peace and conflict research. Today, BICC combines empirical research in conflict regions with targeted transfer to politics," says BICC Director for Research, Conrad Schetter, describing the development of his institute. BICC advises, among others, the United Nations, the Federal Foreign Office and the African Union on issues ranging from concrete approaches to peace negotiations and the demobilisation of combatants to small arms control. The Minister of Culture and Science of the German State of North Rhine-Westphalia, Isabel Pfeiffer-Poensgen, said: "The municipalities and the state government in North Rhine-Westphalia are also drawing on BICC's wide expertise. The institute studies how displaced persons can be integrated into communities and what concrete challenges the receiving communities are confronted with. BICC also supports the prevention of radicalisation in North Rhine-Westphalia in order to find a concrete response to Salafism in Germany and transnational jihad."